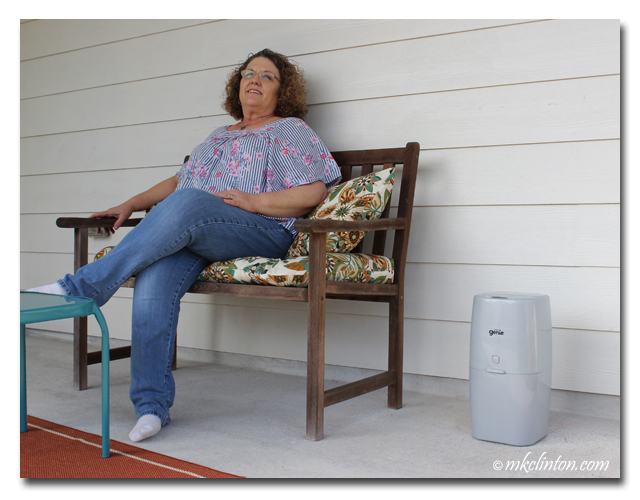 There is nothing like enjoying a summer evening sitting on your patio. I love ours and couldn’t wait to start enjoying it. That means no dog stink. 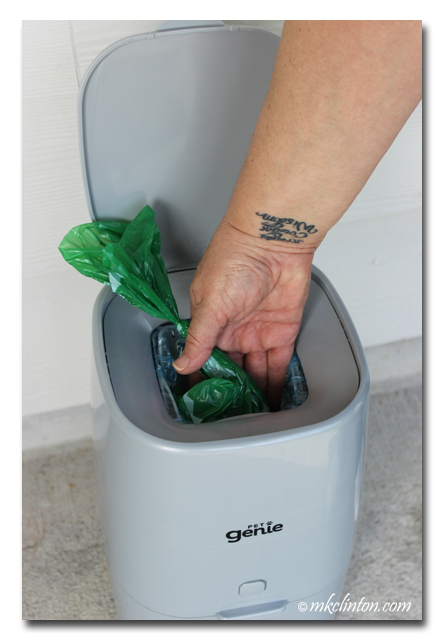 You might remember when we first moved, I wrote a review on Frisco Dog Waste Bags that come in a convenient box for home use. 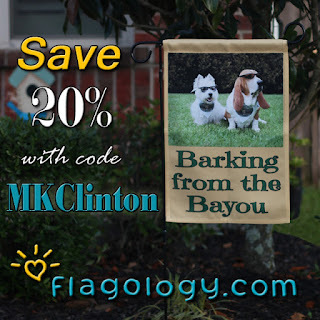 With a smaller backyard, it is important to pick up the boys’ poop as soon as it happens. This little garbage can is what I bought to dispose of the used bags. The white bag you can see is a scented trash bag. When it is closed, no problem, no smell but when you lift the lid to add another bag…UGH! There had to be a better way. 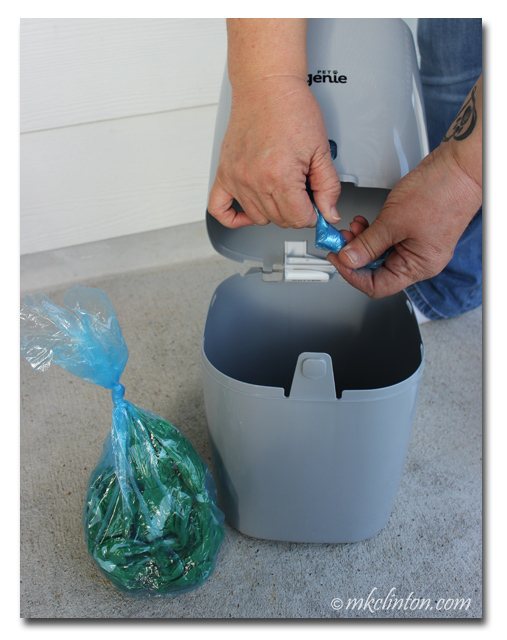 I began searching online for a type of container like the Diaper Genie™ used for baby diapers. That led to the discovery of the Pet Genie™. It is exactly what we needed. How did I not know this existed? As soon as I did, I logged into Chewy.com to see if they sold them. Duh…Chewy has EVERYTHING for pets! There it was in all its glory. The new Pet Genie for under $30. 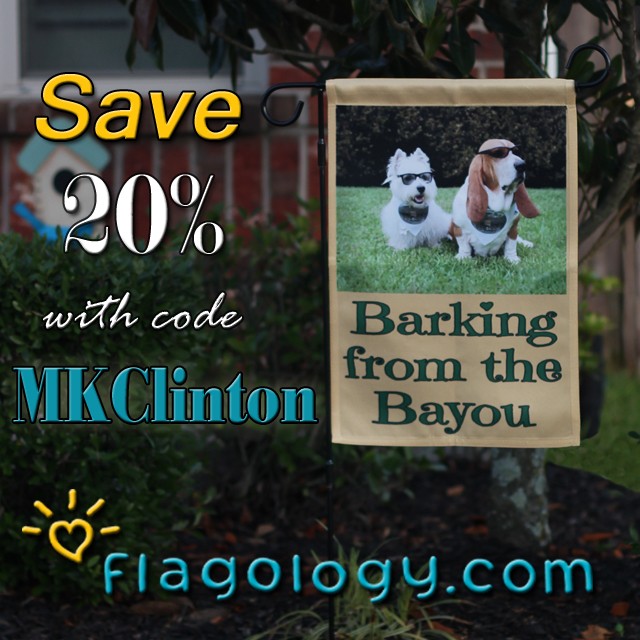 • Holds waste bags, puppy training pads, and pet diapers. *It can hold a dozen used puppy pads at a time. 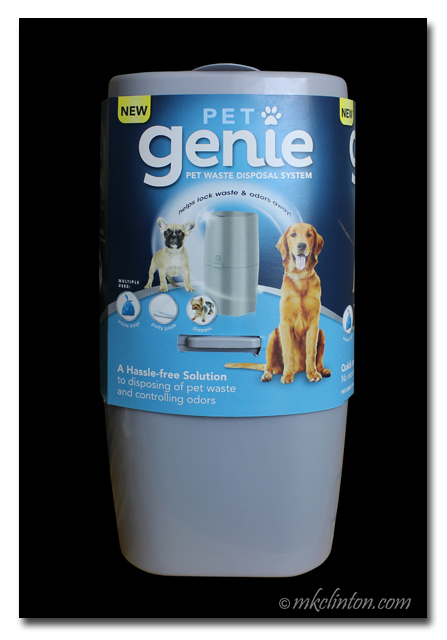 The Pet Genie comes with one refill that contains a seven-layer bag that has 14’ of film. To begin, lift the top and inner lids of the Pet Genie. Pull the film up and out of the refill. Push the film a few inches through the center hole and tie the bottom. These are not perforated bags. It is one continual film sleeve. Feed the knotted end of the liner through the clamp system. The refill fits snug in the top. Open the bottom of the unit and pull the knotted film down until it reaches the bottom and close it back. 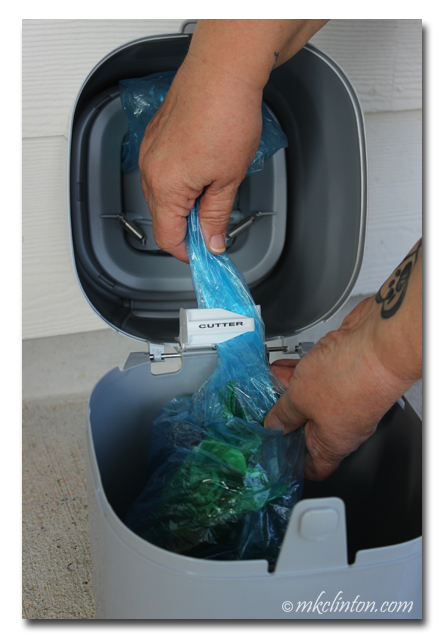 After you have bagged the business, open the top and push the bag through the clamp system. There is no stink! *You can also push the “Press Here” button with your thumb to release the clamp and drop the bag in with your other hand. When it is time to empty your Pet Genie, push the center button on the front and open the bottom half. Pull the film sleeve down a few inches. There is a handy cutter inside, so you simply cut the sleeve using a sideways motion. Tie off the top of the full bag and take it out of the pail. Tie a knot in the open end of the film and pull it down to the bottom. It is super easy. Did I mention that it works incredibly well? To prove my point, I put our Pet Genie close to where we sit drinking our coffee and iced tea. There is zero smell. It is the most incredible pet waste disposal system that I’ve ever seen. 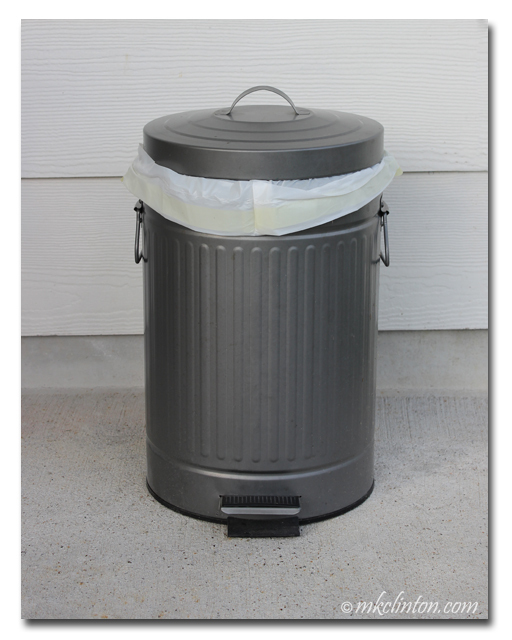 I always dreamed about something that would store the poop bags until garbage day that didn’t stink to high heavens. I am excited to know that I didn’t just have to dream of the Pet Genie. It’s real. 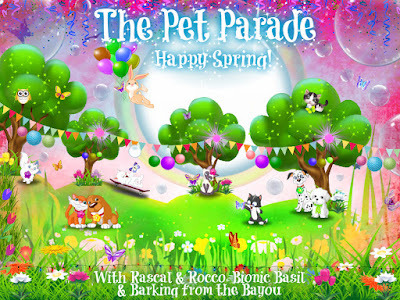 Rascal and Rocco and Basil's Blog. This Pet Genie is awesome! We need to look into this. Thank you! Mom has always wondered why there was no diaper genie for dog poo. Around here, it is only an issue a few months out of the year, as frozen poo doesn't smell at all...amazingly. Mom tries to put most of the poo in the trash on our walks so we don't bring it home. 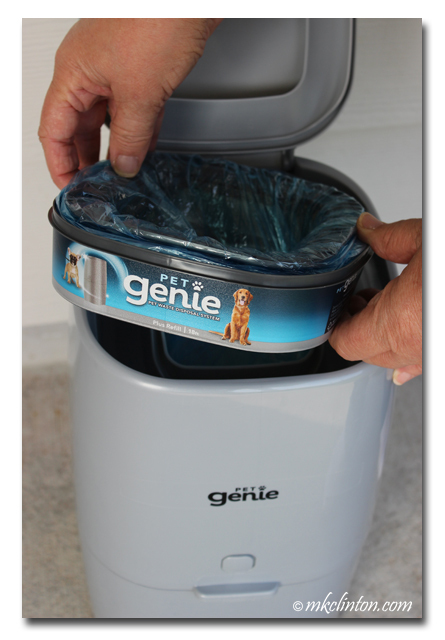 Mom's friend told her that her son and DIL use Diaper Genie some years ago but we had no idea there was one for Pets. Ummmmm mom might need to look into that for me. We wonder if it would work for cats, though a few of our peeballs together can get really heavy. We had no idea this existed either. 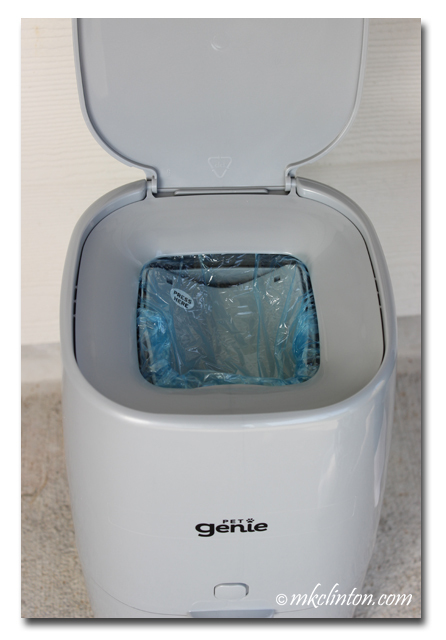 Mom thought the diaper genie was a genius of an idea - we are happy to hear there is one for pets too. Thanks for the review. That looks like a good idea! That looks great 'cept me and Stanley go for quantity in our poops. Dad picks them up with a pooper scooper so they are not bagged. Then they go in a holding area until dad has a big bag full of our poops. Then he shares them with the giant, noisy truck. Keep Calm & Poop On! This sounds like a great idea. We have a poop bucket outside and yes it stinks! There's nothing I hate more than opening up that bucket and the smell that pours out, especially in the summer! Do you know if this can be left out in the weather, or does it need o be under cover? OMD...We soooooo need this!! Thanks for the great review! Wow...talk about a "why didn't I think of that!" moment. Bravo. This is amazing. I drop my bags in the outdoor trash can, and I can tell you, that think is RANK. Especially in the summer. I'm so ordering this! !